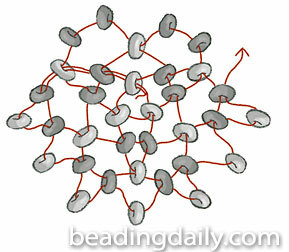 For circular peyote stitch, string 3 beads and form the first round by passing through the first bead. For the second round, string 2 beads and pass through the next bead of the previous round; repeat twice. To set up for the third round, pass through the first bead of the current round. For the third round, string 1 bead and pass through the next bead of the previous round; repeat all around, then step up at the end of the round. Continue in this manner, alternating the two previous rounds. You may need to adjust the bead count depending on the relative size of the beads in order to keep the circle flat.